Tips: Note: Be sure to buy "dry" scallops, which are scallops that have not been treated with sodium tripolyphosphate, or STP. Scallops that have been treated with STP ("wet" scallops) have been subjected to a chemical bath and are mushy, less flavorful and won't brown properly. 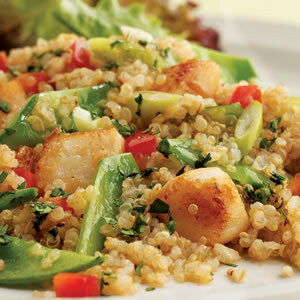 Tip: Quinoa is a delicately flavored, protein-rich grain. Rinsing removes any residue of saponin, quinoa's natural, bitter protective covering. Find it in natural-foods stores and the natural-foods sections of many supermarkets. PER SERVING: 326 cal., 15 g total fat (1 g sat. fat), 19 mg chol., 713 mg sodium, 32 g carb. (4 g fiber), 16 g pro.